It has been a while in the making, but the South Fraser Perimeter Road (SFPR) is now open. What does that mean to you? Well, the new route will mean different things for different drivers. Prior to the opening of the new route, Highway 17 began at the BC Ferry Terminal in Tsawassen and continued to the Highway 99 Interchange in Delta. The SFPR will now officially become Highway 17, and the old stretch of highway running through Delta to Highway 99 will now be called Highway 17A. You can see the general alignment changes in the picture on the right, but we’ve also got a handy pdf to download with more maps and details of the changes. You have two choices to get to and from the George Massey Tunnel and beyond – the SFPR (which will now be Highway 17) or the old highway (which will be named Highway 17A). Please use the new route. At 40 kilometres, the SFPR is a bit longer than the old route, but it’ll be quicker to travel on, because there are more lanes, a faster travel speed and few traffic signals. The South Fraser Perimeter Road was designed as a part of our Pacific Gateway strategy and is to redirect commercial traffic from Metro Vancouver roads and provide a clear route for that traffic from Deltaport into the BC interior and beyond. This new route separates commercial traffic from residential areas, improving safety for local communities and motorists. Regular motor vehicles are welcome to use the new route, but if you would rather steer clear of big trucks, you should find other routes in the Lower Mainland much easier to travel now that this truck route is open. Any thoughts on the new highway? Have you seen any benefits to your travel? If so, leave us a comment below, or connect with us on Facebook and Twitter and let us know. 93 Responses to What Does The South Fraser Perimeter Road Opening Mean to You? How do i get back to the ferry from Hope?is there an exit closer than 66 which i take to go through Surrey etc?I find the signs to the Ferries not clear enough and i end up lost in Vancouver every time..Is there an easier and faster way? What is going on with the road in the 1-2 kms west of the Nordel Way intersection – is the road sinking? I’ve noticed in both directions that over time the dips in the road become more pronounced, and no sooner does one get fixed than others appear. It’s starting to feel like a bit of a roller coaster ride. Thanks for connecting with us here about this. We will share your concern directly with the area manager and let you know when we hear back. We spoke with the area office and they informed us that the Highway 17 (SFPR) segment, west of the Nordel Way intersection, is experiencing some post-construction pavement settlement. The ministry and the Concessionaire (Fraser Transportation Group) are actively monitoring the area and applying pavement interventions until the settlement subsides. Hope that this helps! I get confused by the signs when I leave the Tsawassen ferry terminal and am heading home to Vancouver; I have ended up accidentally on my way to Hope. Could you make it clearer to those Vancouver-bound that they need to go “this” way. I notice other drivers doing the last minute swerve as well as they obviously are also unsure. Today at about 8pm I followed pacific coach bus number 3015 from hwy 99 at oak St. The bus went through the tunnel and then 17. These is a large sign stating no commercial vehicles. The bus made no stops or pickups. Who do I contact? Bc17a is supposedly for non-commercial vehicles but every day I see Pacific coach lines buses come off the ferry and take the 17a exit. Are they exempted from the no commercial vehicle rule or just ignoring it? Hi Gordon. Buses can only use non-commercial routes if they have drop-off and pick-up points within. A quick review of PCL website shows no stops between the Tsawwassen ferry terminal and their Vancouver station. Can you tell me who is responsible for informing/enforcing the no commercial vehicle law so we can confirm and correct PCL? Thanks for your comment. I note from PCL’s website that the bus has Enroute Pick-up & Drop off Points, identified in a dropdown window on their “EnRoute Maps” page. Highway 17 at Ladner Trunk Rd (Pick-up ONLY) is named as one of those choices, but not specifically Highway 17A. I will refer this matter to our Commercial Vehicle Safety and Enforcement staff. In the cases I see the buses did not stop at ladner trunk. In any case I think the SFPR is great. One last comment is bc drivers tend to establish speeds that are safe regardless of posted speeds and when I travel SfPR at 80 I the slowest vehicle on the road. OK in my car but on my motorcycle I am wary of bring passed by every vehicle using Spfr. BTW: Thanks for your prompt responses! I have to be honest, this SFPR “highway” is a poor excuse for a highway; what kind of highway stops traffic with multiple lights, and worst of all, TRAIN TRACKS!? All the stop-and-go produces more collision risks, and far more greenhouse gases (idling + acceleration from dead stop are worse than smooth highway speeding running.) Do the job properly once, and you do not have to worry about it! Lower mainland residents pay some of the highest taxes for driving in North America. These taxes include ICBC (please do NOT patronise us, it is a bloody tax giving $500MM per year to BC government! ), which is triple the cost of any other insurance in Canada; carbon, transit, fuel, and provincial sales tax that is charged on top of GST. Instead of paying the bloated bureaucracy six-figure salaries, why not use that money to PROPERLY build a real highway, instead of producing fake highways with lights like “Highway” 15, Langley “Bypass”, Fraser “Highway”, “Highway” 99 that runs through downtown Vancouver, etc? When will the job, i.e. putting in proper interchanges and barriers for cyclists, be done properly? Sorry to hear your frustration. We will share your feedback forward on your behalf. As others have pointed out traffic gets really backed up in the morning going NB on 17a through Ladner. I work along river road and even though it’s backed up for the people in the right hand lane going through the tunnel it affects everybody else. It affects traffic going to River Road because there are a lot of people who change lanes from the left hand lane into the right at the last possible second before the white barriers, either due to not realizing that the barriers are there and they wont be able to get over or they just don’t want to sit in traffic, causing everybody to slam on their brakes. It also affects anyone trying the head SB on 99 because they either have to suffer through the long line or they go in the left hand lane and hope that someone in the right lane is willing to let them over just before the exit, the latter causing even more delays for anyone heading to River Road. Thanks for connecting with us and for sharing your ideas. We will share them directly with the district office. All highways in BC are designed for passenger vehicles. Our engineers look at many, many factors when designing a road (shoulder width, sight line distance, grade, etc.) and each of these factors are taken into consideration when deciding on where to set a speed limit for that road. In the case of the SFPR, there are factors which require a lower speed limit – limited vision, curves, narrow shoulder room for example. A lower speed limit gives the driver more time to recover from an error in judgement in calculating the speed at which they take a curve. To raise speed limits will require a great deal more signage to warn drivers of curves designed to 80km/h and not a higher speed. The good news is that the SFPR is part of the province’s speed review and speeds may be slightly adjusted. Hope that this helps! So would the maximum speed that a semi truck is able to take a corner and recover from an error in judgement be lower though? This is a tough question as speeds at which a commercial vehicle travels would likely depend on the load they were carrying. Yes, there are curve warning signs in place along the road. Yes, there would need to be more than are in place now, in order provide the travelling public with warning that curves etc. were present on the roadway and should be anticipated. Thanks for connecting with us here. When you get off of the Tsawwassen ferry, you will be on BC Highway 17 and the old route, which runs north toward BC Highway 99 and the Ladner Trunk Road, is marked as BC Highway 17A. You will need to take Exit 7 to Ladner off of 17 to get to 17A and the Ladner Trunk Road. Turn right off 17A and onto Ladner Trunk Road. This turns into 10 and will take you to Mission as desired. Hope that this helps! I love the new SFPR, and it is a road link that was sorely needed in the Lower Mainland. Ever since the road has opened, there has been a few issues that I feel need to be addressed. The first is the speed limit, the vast majority of cars and trucks go 15KM/H or more over the speed limit or somewhere around 100KM/H, which is a reasonable speed limit for a provincial Highway. The cars and trucks that do go the speed limit frankly pose a safety hazard as they are going much slower then most other vehicles on the road. The biggest joke is the section around the Patullo Bridge where the speed limit drops to 50KM/H! For goodness sakes this is a provincial highway (however a sad excuse for one with all the street lights, which brings me to my next issue), the speed limit should be increased at least 10KM/H in all areas to reduce speed variance between vehicles, and a more sensible speed for a provincial highway. My second issue is the Street Lights. As a highway built specifically for commercial vehicles, the street lights make the Highway congested, dangerous, and increase pollution. First of all, the street lights wreck the beautiful new SFPR as everyone comes to a grinding halt it seems at every set of lights. This causes excessive wear on vehicles as well as extra pollution as vehicle come to an idle and then accelerate back up to 100KM/H again. During rush hour there are horrendous backups at the traffic lights, especially lately at the Lights at 104th and the SFPR in Fraser Heights. I truly do not get why interchanges were removed from the scope when the SFPR was under construction. 2 years after completion, and traffic demands already warrant Interchanges at most of the traffic lights. When will interchanges be built along the route? Thank you for reading my issues with the SFPR, and I look forward to hearing from you! Thanks for connecting with us here and for sharing your concerns. We shared your comment forward with the traffic engineering department regarding interchanges and they told us that most projects which the ministry undertakes begin with a fixed budget. This means that the amount of work undertaken is tied to that budget. Construction of large interchanges would use up too much of that fixed budget, meaning much less money to complete the rest of the project. This means that interchanges are often put off on one project with the idea that they will be completed as a part of another one. At this time, we do not have any timeline on when that would be. In the case of the SFPR, they posted the speed to match the constraints of the highway (primarily curves and shy distance to barrier) that is why there are virtually no “Vision Limited” or “Curve Warning” signs on the SFPR highway as the selected posted speeds does currently match these design constraints. To raise the speed will require a great deal more signing to warn drivers of curves designed to 80 km/h and not a higher speed. The good news is that the SFPR is part of the province’s speed review and speeds may be adjusted. That’s a pretty technical rundown of how our engineers decide what speed limit will be used on BC highways. If you have any other questions, please let us know. Hope this helps! When you are talking about design speed does it refer to the “maximum speed that can be maintained over a specified section of highways when conditions are so favourable that the design features of the highway govern” for the vehicles that are capable of the lowest speed? What I’m trying to ask is if the “design speed” is the maximum that let’s say semi trucks are capable of? If so why not make SFPR a dual speed limit highway where there is one speed for trucks and another for everybody else if there is a difference in the design speed? Great idea! Keep it at 80KM/H for Trucks, and 100KM/H for everyone else. Almost everyone goes around 100KM/H already, and everyone seems to come out the other side of the Highway just fine. Are you not going to get back to Chris’s comment regarding a 2 tier speed limit? It makes perfect sense to have 80 KM/H for trucks, and then 100 KM/H for vehicles as smaller vehicles can safely travel at 100KM/H along the road. Also, will the province be putting interchanges on the SFPR as part of the 10-year transportation plan that the province has introduced? I saw in the plan that the province will construct “Interchanges throughout Metro Vancouver”. If not, where will the province be putting interchanges in Metro Vancouver? We are looking into a 2 tiered speed limit at this time and will let you both know when we have more to share. We have sent your question about interchanges forward to the Lower Mainland District office for review. Stay tuned! I wanted to go from the Pattullo Bridge to highway 99 using the new SFPR. I discovered too late that there are no signs directing you to the new highway. I made had to backtrack so now traveling North on the King George Hwy, I noted there are no signs in that direction. I found my way to Scott Road and noted that there were no signs directing me from Scott Road to the new SFPR. Why is it that despite the fact that this oversight was pointed out on this site in January 2014 has nothing been done to correct the problem? Sorry to hear you had trouble navigating. I’ve sent your issue to the local operations manager. Once on the SFPR, there are overhead and shoulder signs directing drivers to Highway 99. Please note, since the Pattullo Bridge and the connecting arterial road is under Translink and Surrey’s jurisdiction, respectively, it will be their call to install additional guide signs to Highway 17. Love the new route when we come from Victoria to go to the interior; so much better then having to go through Langley and Cloverdale. Like others, I find that 80km/h is too slow for that highway; everyone is doing 95+, so I would think 90km/h is fine; at least until you get to lights at Tilbury. Also, the design of trying to get to Hwy 1 East from 17 East is challenging. You need to be in the right lane for the exit, but are following very slow trucks coming up the long hill (who were stopped at the light at the bottom). So instead you see people passing the trucks then quickly moving to the right lane at the Hope exit. Not sure how this can be fixed, but it can be nail-biting coming up that hill if you want to get on Hwy 1 East. Perhaps replace the light at the bottom with an interchange so that trucks aren’t already stopped at the bottom. Hi Greg and thanks for the great feedback. We are glad to hear that you like the SFPR – we do too! As you probably know, the South Fraser Perimeter Road was designed as a part of our Pacific Gateway strategy and its main purpose is to redirect commercial traffic from Metro Vancouver roads and provide a clear route for that traffic from Deltaport into the BC interior and beyond. We are happy that regular motor vehicles are using this route also but it is important for them to give truck drivers the room they need to maneuver their rigs safely. Because the route was designed for commercial drivers and also because there would be considerable cost involved in constructing a new interchange, we encourage regular motorists on the SFPR to give those big rigs a break while they move out of the Lower Mainland and into the rest of the province. Higher speed limits and space are available once you are on BC Highway 1. Safe travels! 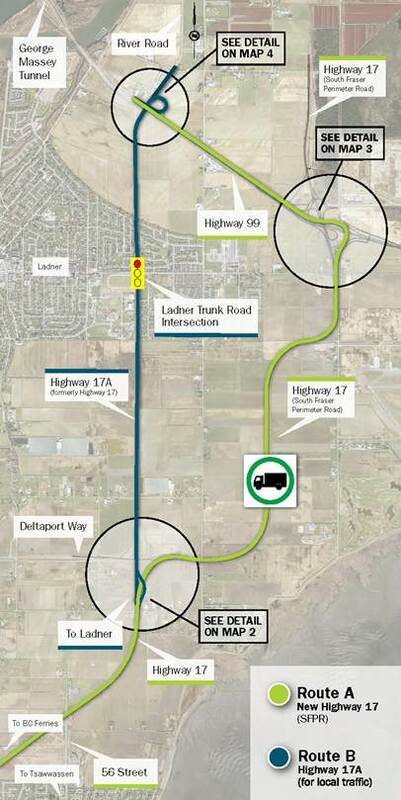 This new highway has just created more issues for people from ladner. Now almost every morning that I would like to take 99 south to work I can’t because hwy 17a is backed up all the way to Ladner. The cops sit there ticketing people that try and drive down the shoulder because there is no other option at that point other than waiting who knows how long to get to the exit for hwy 99. And for the new hwy 17. This new hwy is just like hwy 99 in its size and design yet the speed limit is a low 80 kmh meanwhile hwy 99 is 100kmh. 80kmh is to slow for this hwy and the cops are again taking advantage of it by ticketing people for speeding. There is no reason this hwy should not be the same speed as hwy 99. Having multiple speed limits on similar highways that are connected does nothing but set people up for police speed traps. If your going to say it’s because of the trucks then have two speed limits. It’s done that way in washington state and works great there. So basically the two groups benefitting from this are the cops and icbc as they collect ticket money meanwhile the rest of us just wait longer in traffic lineups. Thanks for the feedback Scott, we appreciate your taking the time to connect with us here. We have forwarded your comment to the area manager. The other day I drove from Chilliwack to the Van. Airport. I drove the SFPR as I often have when going to ferry terminal at Tsw. and that’s easy but I got lost trying to get onto the Alex Fraser Bridge to go to airport. I followed airport signs that were clearly evident along the new highway up until a turnoff towards Hwy. 91, I think but didn’t see an airport sign after that so ended up driving towards North Delta, My friend in Chwk. who comes from California and drives like a trucker warned me that she also got lost tried to explain before I left home but I got lost too so where is the airport sign? It might have been better to go north on 99 and go through tunnel to the airport? At least I don’t think I would have got lost. I eventually found my way! Lack of airport signs when turning left off SFPR to Alex Fraser. I live near the Alex Fraser bridge in North Delta. I had need to go to the Delta Hospital and had no problem finding my way there……coming back; not so easy. I asked two people at the hospital and one said just make sure you’re driving east, the other said make sure to drive north. I was on my own and did not see any signs for either east or north and no signage whatsoever for North Delta. I know there was traffic smoking from S. Delta as I could see them while i had travellled south but how the heck does one get to be one of them after leaving the Hospital? One solution I have been given is to go to SMH instead. Now, is that nice? I am a resident of Delta so shouldn’t I use my own community hospital? What if a friend was in the Delta Hospital, how shall I get home? I’m sorry you had trouble with the signage. I’m connecting with the district to try to identify the problem. Were you trying to travel back to North Delta via SFPR? Which road did you travel on when leaving the hospital? What in the world has happened to tunnel traffic in the past month? Prior to the construction of the SFPR my commute from Tsawwassen to UBC averaged 45 min during rush hour, 35 min in non rush hour. After the construction it increased from 5-10 minutes. (Note that due to the change in the bus route, commuting by bus has also increased in time by about 10 min.) In the last month that commute is averaging between 1 hr and 1 hr, 15. Today I left at 6:50. It took me almost 2 hrs to get to UBC. It took me 50 min to get to the tunnel. There was a stall (not an accident, just a stall that closed one lane) before the tunnel which you might expect to add 15-20 min. Traffic was backed up to practically City Hall in that one right lane. There were “cheaters” trying various ploys to get ahead of the one lane – turning at the gas station across the highway, turning down the road to the dump and trying to turn back onto River Road. There was thunder and lightening. It was like Armageddon. In previous years I might have a commute like this once in 4 months. Now it is practically every day. What on earth is going on? I might as well be living in Chilliwack. Thanks for letting us know your concerns Anne. We have shared this comment forward with the area manager for review. I completely agree, Anne! I also commute to Pt. Grey and the tunnel has been a nightmare since mid-September. Regardless of which route I take Monday-Thursday (Hwy. 17 vs. SFPR) or what time I leave (6:45 am -7:00 am) there’s a bottleneck. When the SFPR was initially completed, it added 10 minutes to my commute. Now, my commute has increased by 30-45 minutes, at least! South Surrey residents commuting on Hwy 99 sail through, whereas Tsawwassen & Ladner residents crawl in traffic. What’s happened to create this excessive congestion? The SFPR has greatly benefitted everyone except for Ladner and Tsawwassen commuters. Even the HOV lane on Hwy 17A is congested now?! We’re always hearing the contrived response from The Ministry that our comments will be shared, discussed, etc., That’s wonderful, however, is the Ministry of Transportation really going to examine these issues and consult with Ladner and Tsawwassen residents? For weeks, I’ve seen traffic counters along various spots on Hwy. 99 northbound, after exiting the tunnel. A recommendation: Place traffic counters along Hwy. 17A enroute to the tunnel, after Ladner Trunk Rd., and Hwy 17 (SFPR) at the dump curve to measure traffic. And then, determine a solution for this commuter nightmare for Ladner and Tsawwassen commuters. Thanks for your feedback Alison. We hear your frustration and appreciate your concern. We have sent your comment forward to the area office, please stay tuned for a reply. We received some information from the district that should help explain. Since the opening of Highway 17/SFPR, we’ve been monitoring traffic accessing Highway 99 north to use the tunnel. As a result of monitoring, we’re currently working on improving the merging of Tsawwassen traffic with Highway 99 northbound traffic accessing the tunnel. Once complete, Tsawwassen traffic will be able to use either Highway 17A to access Highway 99 north, one of the existing routes currently used, or take the SFPR to Highway 99 north and merge onto the highway sooner than what exists today. This improvement will also permit the use of the northbound counter-flow lane, which is not accessible with the current configuration. Construction started mid-October, and should be completed by end of November. We will continue to monitor traffic to assess the effectiveness of these measures and where additional measures might be needed. We’re sorry for the inconveniences to you, and other commuters, while we work to improve traffic flow. Perhaps I missed something – BUT the last time drove from the Tsawwassen heading NORTH there is/are POOR SIGNAGE @ the exit 7 when driving on Hwy 17 – this is with my goal to head EAST on the S Fraser Perimeter Rd. My advise is DO NO DRIVE IN THE RIGHT LANE when heading North from the Ferries – MOVE INTO the RIGHT LANE – THEN take the 2nd off-ramp @ the Exit 7. Other than that… it is a have-decent bypass for sure. CAN SOMEONE PLEASE FIX THE SIGNAGE AT THIS EXIT…. To confirm, signage has been updated at this site during the last year. We cannot attach images in these comments, but we have shared the updated sign with you via your email. If you have any other questions or concerns, do not hesitate to contact us. Thanks! I’m nervous. The last time we used Hwy 17 to get to Vancouver we found ourselves heading towards the land fill!! This happened twice! Walk me through step by step how to leave the ferry terminal at Tsawassen and get through the Massey Tunnel. We recently drove from Victoria to Calgary and were so surprised and delighted how simple it now is to navigate from the Tsawwassen ferry terminal to the Trans-Canada Highway. The old route was unaffectionately called, by our family, “the Dumb Road” because of how easy it was to get lost, how poor the signage was in places, and how slow and inefficient the route was. We’re in Calgary right now and are looking forward to taking the SFPR on our way back. We’re now thinking of calling this “the Smart Road.” Cheers! The HOV markings for northbound Hwy 99 traffic are very poorly done. I was driving north at rush hour yesterday evening, and when approaching the Hwy 17 interchange signs indicated that the HOV lane was ending. I merged left into regular Hwy 99 traffic, and suddenly found myself trapped in a huge lineup of cars. Meanwhile on the other side of the barrier there was an empty HOV lane that I had no way to get to. Hi Marilyn, if you travel on BC Highway 1 towards downtown, you should be able to take an exit on to Highway 17 at the 176 Street exit. Hope that this helps! Many Tsawwassen residents seem to have switched back to the old route to tunnel based on word that the old route is ‘so much faster’. I like the consistent flow and lack of full-stop intersections, and find the connections to NE areas in Tillbury, North Surrey and Fraser zones are great. Apart from the straight line route, one contributing factor to the drivers choices might be the speed limit – 80 kph on new SFPH, 90 kph on old route. Although the nice road base/asphalt make for a very pleasant, quiet drive, the perception of a longer route at a perceived ‘unbearably’ slow speed, along with no trucks on the 17a might be swaying many to stick with the old. I am of the opinion that 80kph on the south stretches creates problems: few follow it, and those who do only do so in corners and at the potential speed trap pull-outs, followed by prompt acceleration, lane changes, etc. I suspect 80 or 90 were the ‘design speed’ criteria, based on corner radii and a desire to reduce land use, but I would respectfully put in a request for re-evaluation. I realize there are a few snug corners, and uneven transitions from road curve to bridge curve (on Google Maps, 49.058429, -123.055481 being the most notable), but a transition at 49.064565, -123.03604 would respond to the long straight stretch which honestly causes the most variations in traffic flow patterns, with few abiding with the posted limits. Tourists do, locals don’t – variable flows and lane changes, and potential problems begin. The combination of straights/tight corners and high visual side barriers definitely have created a road that takes some familiarity to make it comfortable at constant speeds. More speed monitoring on 17 will simply drive the locals back onto 17a, right through the city with stop/go lights, and with that, more complaints about overload on the 17a / Tunnel turnoff loop. Secondly, the Hwy 17 turnoff from Hwy 99 westbound (49.095714, -123.025130) has some serious complexities for those who don’t know what to expect. An HOV cross-over with a ‘Tsawwassen bound’ double right lane switch, all in an anticline, blind corner? We tend to run into this from HOV, but are watching the confusion around us. I would request a re-evaluation of signage location, and an opening/blending of HOV/SOV traffic to allow earlier merging and adjusting ( possibly 49.094182, -123.019654), which would put signage prior to blind corner. I worry about oncoming tourism season and the potential for accidents here, we’ve seen enough confusion and last minute brake lights after signage finally becomes visible. Again, mixing familiar with unfamiliar drivers will cause the friction, and this one gives very little time to think/react. If the design speed is so low that it is assumed travellers have plenty of time to make decisions then one should actually travel it in regular traffic to realize that at common speed, the transition is too tight and concealed. Give up the HOV for a bit, there are no cheaters this far back, let the Island-bound tourists change earlier and more safely please. Final consideration: in spite of desire to reduce footprint on Agri land, I would really ask that future road consider a separated cycling strip. Current barriers keep debris on track, even if there is enough width to fit in bikes, without a physical separation of at least a 150 curb or similar, debris will always be a challenge. Possibly have continued a non-loadbearing paved strip outside of barriers? Could this also serve as emergency vehicle access strip? If staff might suggest that the country roads are now safer for bike routes, I would welcome taking anyone on a group bike ride or a working commute throughout these routes with no shoulder, deep ditches and 80kph (min.!) car traffic. We need to begin to allow separation to stop the rhetorical war between 2 wheels and 4 wheels. GM does not have imagery, not sure if coordinates will help you, but thanks for the consideration. Its a great route, helped us with SW/NE access a lot in spite of complaints. This kind of leadership on infrastructure planning is necessary, as this wasn’t about buying additional cars, it was about safely moving goods and people through a route that will be used as long as there are ferries and ports nearby. Thank you for this forum and responses. The road is well done, much appreciated, and even more appreciated if it could be coupled with a safe biking strip – from Victoria to Hope? might help avoid the driving patterns that are not making it safer. Second, have you had comments on the turnoff from 91 to South/Tsawwassen ()? We are used to it, but a tough transition for tourists caught in the left ‘Tsawwassen’ lane, with the crossing over of the HOV tunnel-bound. For sight lines, wouldn’t opening the HOV/Tsa turnoff cross-over opportunity, plus some earlier signage visible before the curve starts () help those without a pre-empted voice command GPS? We’ve seen a lot of confused people at this point, and are waiting for the summer tourist accidents to start. And that would be unfortunate. All in all, great work, very much appreciated apart from little tight spots and of course, the speed limit. Being friends with Civil Engineers, they have lectured me on design guides, but after a few examples around the lower mainland, I’m wondering if it isn’t time to reconsider the true ‘feel’ of what some of the lower limit guidelines create. I understand the political issues about minimizing land-use, especially in Agricultural zones, but function and safety are also valuable considerations that last long after the political bickering about expansion. Good forum, thanks for responses. I too love the new SFPR for getting to Surrey to work, to White Rock from Tsawwassen – cuts down my travel time! * why is the speed limit only 80 kph when the original Hwy 17 (now Hwy 17A) is 90 kph, and there is a short distance coming off the SFPR onto Hwy 17A into Tsawwassen where it is 80 kph and then it’s back to the 90 kph? Hwy 99 is 100 kph! Looks like an opportunity for the police to grab a little extra cash which I have seen several times!! Most trucks and cars are travelling 100 kph which is a very safe speed. * the signs for traffic heading north on Hwy 99 branching off to River Road, Vancouver via the HOV lane and Tsaw.) are confusing because of the HOV lane on the right of the 2 lanes and as well the sign for Tsawwassen is in the middle of the 3 highway signs (vancouver, HOV; Tsawwassen) making it look like the middle lane is for Tsaw. when in fact it’s the far right lane (which is also the HOV lane when you are heading for the exit, and there is no warning and quite unsafe when people are suddenly having to switch lanes at the last moment. And the sign for the Tannery Road/103rd st is situated after the “turnoff decision making point” – not too helpful when one is having to make a quick decision. I thank you for looking into these examples of confusion in the signage along the SFPR, and perhaps a revision of the speed along the road as well. Thanks for the feedback Ann, glad to hear that the new road is helping with your travel time. We have been making signage adjustments to the new route as they are identified and we value your feedback. We will forward your suggestions along to the area manager for further consideration. We do try to keep signage as simple as possible, posting the destination on the sign rather than stops along the way. That being said, we are working on posting New Westminster as a destination on this route for clarification, as we understand not all drivers are going as far as Hope. We do try to keep directional signage to a minimum in order to help keep drivers from distraction while driving, but there is a balance to be struck between too little and too much. As for speed limits, this route is under consideration for review as a part of the Speed and Safety Review. There are some stretches of the SFPR which have poor sight lines that account for a dip in posted speed limit. Hope that this information helps and stay tuned for ongoing signage and speed limit changes, thanks again! There is a signal at the intersection SFPR and Highway 91 Connector, from there you can access the Airport via the Connector to Highway 91. There are signs on SFPR to indicate this as you approach the intersection. Further, if you continue along the SFPR you can access the Airport via the GMT, while this is a longer route, it will also take you to the airport. Hope that this helps! I always go from the ferry to why 1 east along #10. Can I use the the new SFPR to connect to hwy 1 with fewer hassles? Is the road completely finished now..Feb 2014? The SFPR is now completely open. It doesn’t link directly to Highway #1 but it should save you some time getting there. Let us know what you think. Travel from the Valley to Tsawwassen and Point Roberts frequently. Best road built/improved since the Coq. (I’m not counting the PortMan & #1 cause I seldom use it past 176) Well done. With the stretch of # 1 through Langley included on our commute we save a ton of time from the old routes via #10, O Ave. and other roads off and on. Sounds like 99Northbound to the tunnel from the SFPR during rush hour is still a pain though. Good Luck with that. Maybe Ms. Floyd could use the Alex Fraser depending on where in Burnaby she is going. Since the opening of the South Fraser Perimeter Highway I have seen my commute increased by 20 minutes to 40 minutes depending upon the route I take. Monday, I left home my home in Tsawwassen at 7:40 and took the new highway. 30 minutes later I had not even entered the tunnel. My 45 – 50 minute commute to Burnaby took 1 hour and five minutes when it would normally take between 45 and 50 minutes. This morning I left at 7:05 and took highway 17A. By 7:45 I was not even through the tunnel. I arrived in Burnaby at 8:10 a full 1 hour and 5 minutes later! Normally at this time in the morning I would my commute would have been between 40 and 45 minutes. I cannot even begin to describe my level of frustration at being late for work and at the amount of gas wasted and additional green house gas generated. I fail to understand why the two lanes merging off of River Road onto highway 99 has been reduced to one lane. The result is obvious, traffic backed up through to Ladner Trunk Road. Many, many people have opted for the HOV lane and risk the $167 fine just out of pure frustration. The situation is identical when merging from the new Highway 17 onto Highway 99 with two lanes merging into one and then merging with the traffic from Highway 17A/River Road and backing up for at least 20 minutes. In the meantime the three lanes from South Surrey and White Rock are all flowing smoothly with large gaps of no traffic at all. I can’t even begin to imagine what it is like when you add the traffic from the ferry into the mix. My hope is that this two lanes into one is only temporary but I no longer see any workers on either of the highways and am left to wonder why the people responsible for planning these traffic corridors find it acceptable to spend billions of dollars in tax payers money and add twenty minutes to half an hour onto the commute of the citizens of Delta. I wish I could take transit to work but the minimum amount of time each way would be one and a half hours for a total of three. Perhaps someone from TranBC would like to experience my morning commute and those of the other Delta residents. Sure the road is great if you are going to Surrey. But what about the people who work in Vancouver, Burnaby or Richmond. Our commuting needs have been totally disregarded and made dramatically worse. I actually miss the trucks! Thanks for contacting us Brenda. I can certainly appreciate your frustration, no one wants to wait longer in line anytime of day. We are going to share your concerns about the merge lanes from 17A onto 99 and from 17 onto 99. Once we have answers for you, we will let you know. Thank you so much. It means a lot that you will follow up. I think if they tried it themselves they would immediately grasp my frustration. I have been trying to figure out why they would reduce the lanes to one but can not see a logical explanation. If we were allowed to merge onto Highway 99 half way between the exit and where 17A enters it would make a huge difference to Tsawwassen and Ladner commuters. As it is, we watch helplessly from the parallel lane as all the other traffic sails by. I take the SFPR back and forth to work – live in Abbotsford, work in Richmond. It’s a great route and saves time. I have 2 huge complaints though – the huge bump in the left lane going east going up the hill approaching going under the Port Mann bridge. I’ve seen work done on it a few times, but it’s still deadly to small cars. My second major complaint is the merge from the northbound onto highway 99. That’s a nightmare in rush hour traffic with River Road and the 17A merging into one, and then the way the merge is onto the 99. I’ve seen far too many accidents while vehicles are trying to merge onto the 99. It’s a deadly spot. One question I have is what happened to the speed signs by Tannery Road? They appeared to be smashed out, and now they give the wrong speed of your vehicle. Thanks for your question and comments, Elaine. We appreciate your feedback and we’ve sent it to the operations manager. We’ll keep you posted. The ‘bump’ on Hwy 17 eastbound, just before the Port Mann Bridge, is indeed a road settlement issue as it relates to a sewage main beneath the road. During a good weather window, crews had the opportunity last week to do some additional patching to the approaches. Ongoing monitoring of the settlement continues till the larger road re-construction remedy can be carried out. Thank you for letting us know about the speed signs on Highway 17 at Tannery Road, I will have staff verify their condition in the field. Have driven the SFPR many times and helps me greatly! But a safety concern that I have witnessed is that the drop from 80 to 50 at the lights in the North Surrey area is excessive to the point that many cars are safely still travelling at 60-70 and able to react to the lights… but the cars dropping to 50 to observe the limit are actually a safety hazard and are causing near accidents around them. A posted limit of 60 km/h is far safer in the vicinity of those lights!! Thanks for sharing your concern with us Sean. We have shared your comment with the operations manager for the area. When do you expect that GPS companies will be notified about the new highway opening and old highway 17 name change? I notice that Google Maps has been updated, but not others. Where exactly are the traffic lights located? Also, you state in the article that, “Highway 17 began at the BC Ferry Terminal in Tsawassen”, this is not entirely true. BC Highway 17 begins at the head of Blanshard Street at Southgate and Superior Streets in Victoria. Thanks for the comments Andrew. And you are correct, Highway 17 does start in Victoria, but to help people understand how things had changed on the mainland, we didn’t trace the route back to its origin. We will forward your request for more information about the traffic lights and GPS companies as that is not something we have on hand. We will let you know when we have an answer for you. Thanks! We have already put the SFPR into OpenStreetMap. And I now use the name “South Fraser Perimeter Road” to refer to the *entire* stretch of the Mainland portion of Highway 17, all the way to the Tsawwassen Ferry Terminal. Thanks for the comment David. Google Maps and Bing have also updated the local area map to reflect the change. It is important to note that some independent GPS companies might not have done this yet but should eventually update their information for their subscribers. Have driven it several times and it does td job niceley. One improvement I wouldn’t mind seeing in the future are some more advanced notifications for the lights that are present on the road. At the posted speed limit with the current flashing amber signs where they are you can find yourself slowing fairly rapidly due to the lack of space between notification and the light. Several times I’ve found myself stopping at several of the yellow lights in succession and I’m no mechanic but it seems a little more lead time would be easier on the brakes. Otherwise the road is fabulous. Hi Cam. Thanks for the feedback. We will share it forward on your behalf. From the day they started planning construction it was always called South Fraser Perimeter Road, now the few signs you see, only say Hwy 17. Could be confusing for many. No direction signs on Pattullo Bridge or Scott road on how to access SFPW, nor any sign for the best route to get on to the Pattullo Bridge from the SFPW. Hi Michael. Thanks for your comment. We are fowarding both yours and Craig’s comments for consideration to the area manager. As an amateur photographer I see great new perspectives and spectacular shots of the 3 bridges from driving along the SFPR! I took the SFPR from N Langley to Twwassen to attend a birthday party. Smooth and fast all the way – I enjoyed the ride. I drove after dark – are the direction signs made with reflective lettering? They don’t seem to ‘light up’ in the dark. All highway signs are made according to the American Society for Testing and Materials (ASTM) reflectivity standards to ensure there’s a high degree of visibility during night time and inclement weather conditions. We need a snappier name for this road. A real mouthful for the traffic reporters on the radio. My vote is for “Delta Bypass”. Great road by the way…lots of lovely curves and no long boring straights. My buddy Daniel says “Delta Sidewinder”. Thanks for the suggestions Jasper and Daniel. We will definitely keep those in mind ;). Around here we just call it the SFPR. We travelled the SFPR on Dec 30th on our way out to the valley. It was the longest ride without lights that we’ve had in a long time. The trip never seemed to end! Smooth and a great ride. I love not having to travel through Langley – rough roads, congestion and too many lights. Great new road!! Glad to hear that Yvonne! Thanks! The statement about there being “no traffic signals” on the SFPR is not correct. The post has been updated to reflect this – thanks! I had the opportunity on the night of Christmas Eve to journey on the new SFPR from the ferry terminal in Tsawwassen to the 176th street exit. The road was smooth, not congested, very few traffic lights,no tolls,all in all a great ride!!! The speed limit was 80km which I thought would have been a bit higher however we did save 20 minutes off our usual drive from North Surrey to the ferry. Great new ROAD!! !